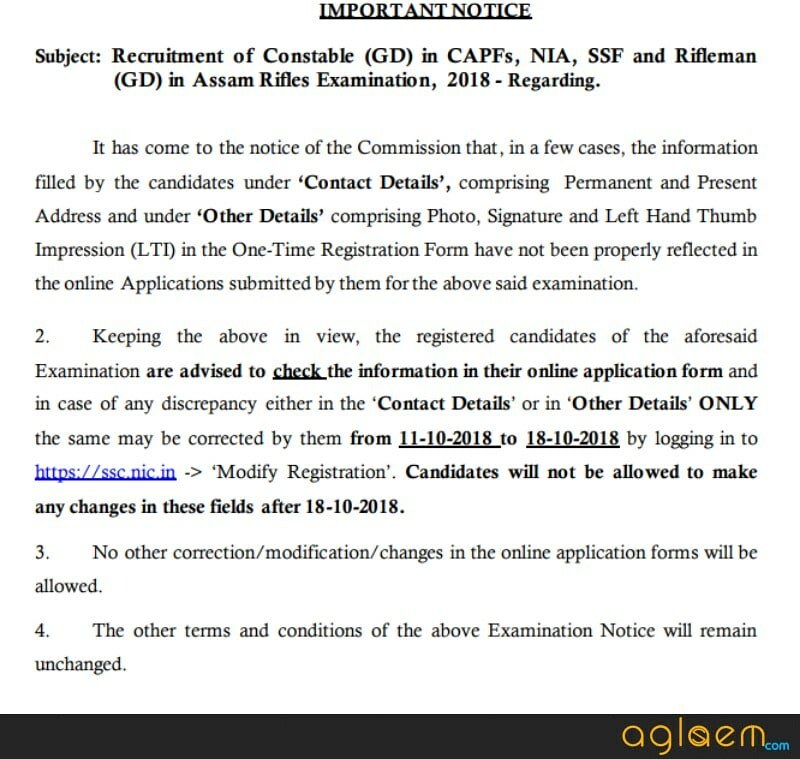 Staff Selection Commission (SSC) has released the SSC GD Constable Application Form Correction 2018 on October 11, 2018 at the official website i.e. ssc.nic.in. The candidates who have registered for SSC GD Constable 2018 those candidates is able to do the correction in their application form. Before or Till October 18, 2018 candidates will only be able to do the corrections in the SSC GD Constable Application Form 2018. Candidates will only be able to edit the 4 Fields that are Contact Details, Photo, Signature, Thum Impression etc. From this page, the candidate will get full information regarding SSC GD Constable Application Form Correction 2018. Latest: The correction window in SSC GD application form has been started, check the same from below. Candidates need to re-correct the details in the application form in a proper manner. For more details regarding SSC GD Constable Application Form Correction 2018 candidates can see the below-mentioned schedule. Application Form Correction: Click here to correct Application Form of SSC GD Constable 2018. There Is No Application Form Correction Fee. How To Correct SSC GD Constable Application Form 2018? For doing the correction candidates need to provide the Username, Password at the login page then only the candidate’s application form page will open at the screen. Follow the below-mentioned steps for doing the correction in the Application Form. Fill Username (Registered Email ID), Password (SSC Registration Password) and Captch in the login page. After filling the details click at the Login button. Thereafter Application Form Page will open. 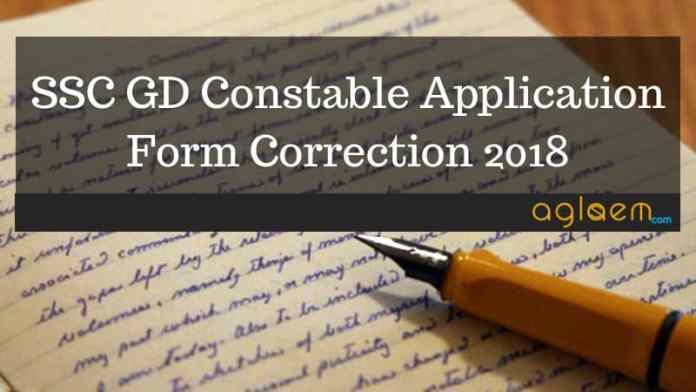 Which Particulars Corrections Are Allowed In SSC GD Constable Application Form 2018? Candidates are only be allowed to edit the 4 Fields in the application form. The candidate does not have to pay any fee for doing the application form correction. Candidates are allowed to edit or correct the Contact Details and Other Details. Under Other Details, candidates are allowed to edit the Photo, Signature and Thum Impression. Multiple times candidates can do the correction in the SSC GD Constable Application Form 2018. Candidates should provide valid details in the application. This correction facility is given by the commission for only one time so within the time duration candidates should complete it. But candidates should note that after the last dates candidates will not be able to do the correction in the application form. Candidates should follow the criteria given below while doing the correction in SSC GD Constable Application Form 2018. Invisible signature due to poor scanning or very small size is not accepted. Horizontal photograph & vertical signature not accepted. Do not use all capital letter while doing the signature.